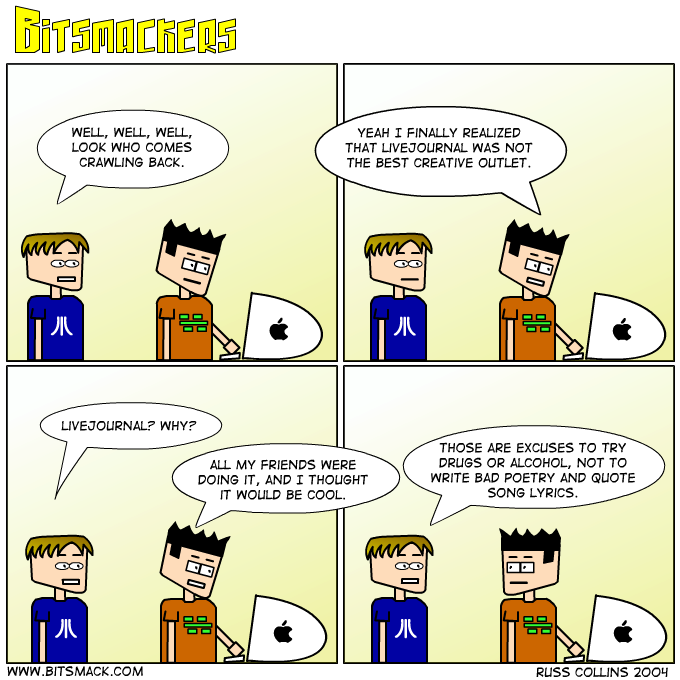 I decided to put up a special <a href=http://www.bitsmack.com/modules.php?op=modload&name=Comics&file=index&action=comic&id=425>Saturday comic</a> to celebrate my return. Let me explain. When I quit doing the comic I was feeling uninspired and I wanted more time to work on other projects and play more video games. Then I got sucked into the soul crushing Livejournal. Basically it is a way to complain about your day and read about your friends complaining about their days. I don’t play video games any more than I used to and I haven’t worked on any other projects. So I decided it was time to bring back the comic. Enough people told me they didn’t care about a new layout or any new features, they just want the comics. I’m all about giving the people what they want so the comic is back on Tuesday’s and Thursday’s. I hope to get the characters page updated this weekend and you can still post video games reviews just like old times.